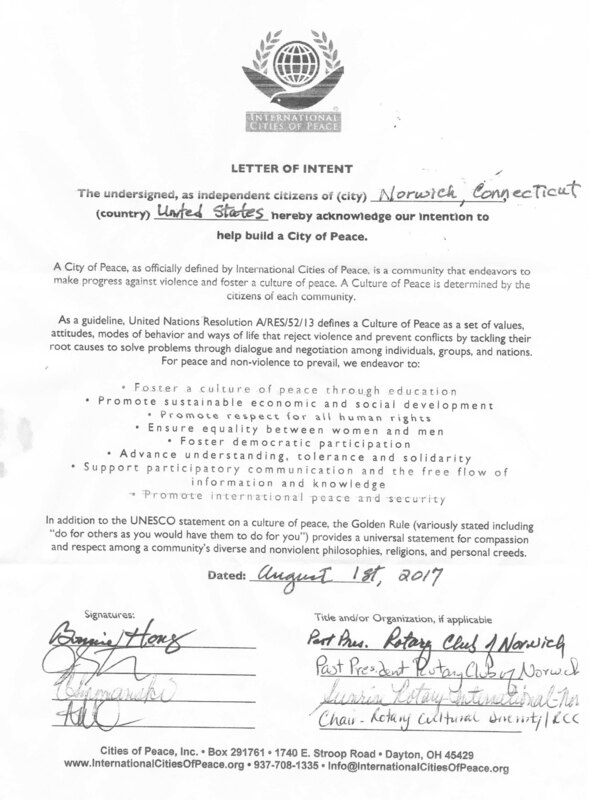 We welcome Bonnie Hong and the citizens of Norwich, Connecticut: City of Peace. 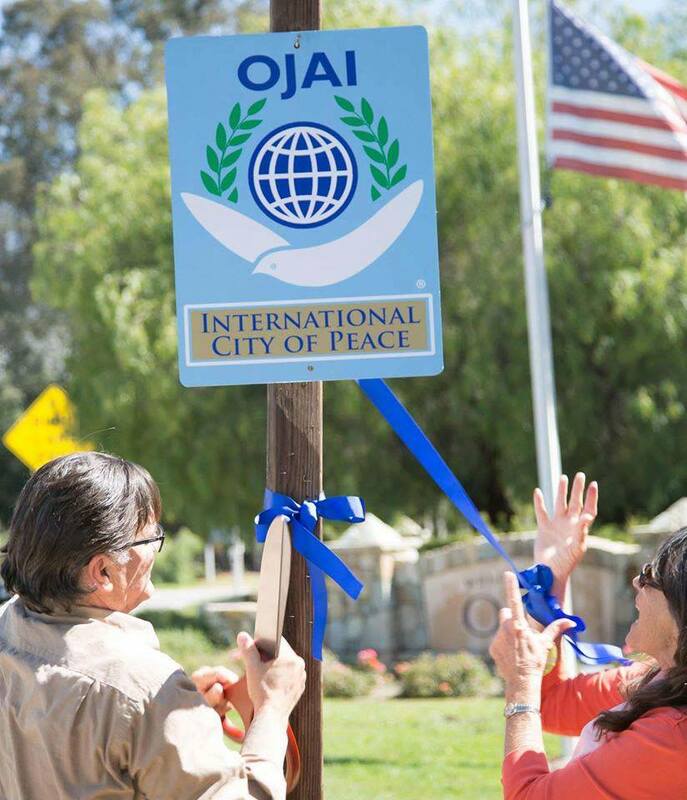 As an International City of Peace we are proclaiming our shared desire and values with other Peace Cities. We believe that every citizen in our Community deserves equality, justice, and prosperity. Differences will always exist. Do we embrace as part of the whole that makes us stronger, or do we continue with bigotry, prejudice, and conflict? Differences often disappear when we get to know the person. Conflict can usually be resolved with a non-violent solution. It is this mindset that we are working toward. 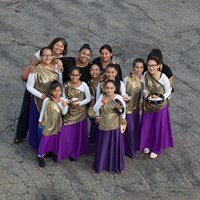 The Rotary Family in Norwich includes members from all interested groups in the Celebrate Diversity Committee (they have been responsible for spearheading this event). 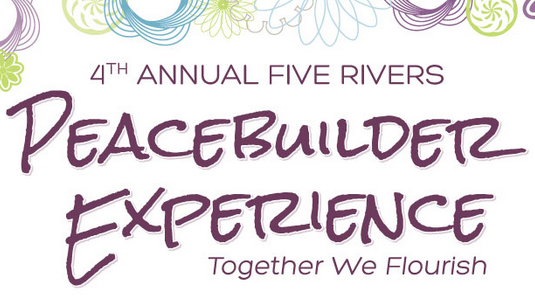 We are a community of diverse cultures that at its heart is a unifying culture of peace in both mind, spirit and action. 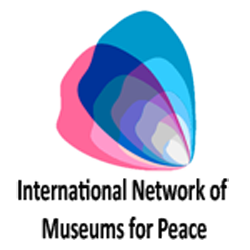 We wish to maintain a strong and powerful identity for the City of Norwich and its residents, in being a Welcoming City. Together we can build a future of hope, prosperity, respect and responsibility. 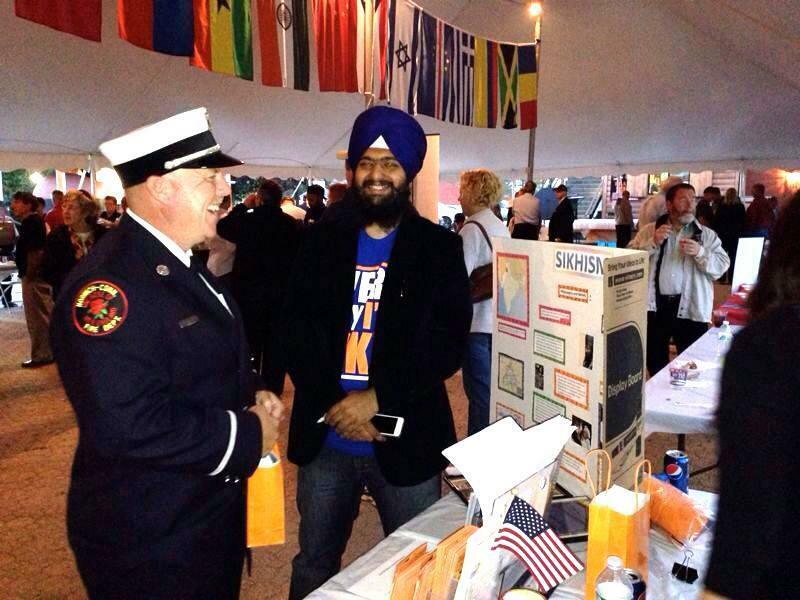 We want to encourage a community that connects with and knows and respects its neighbor of all ages, backgrounds, abilities. 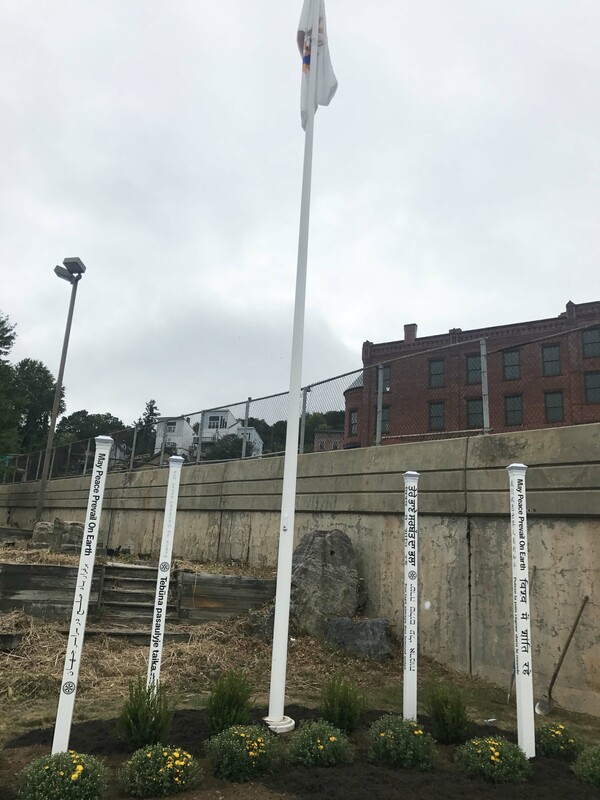 We have established a peace park at Howard Brown Park at the Norwich Harbor which contains Four Peace Poles each with 8 Languages for a total of 30 foreign languages spoken in the homes of Norwich Residents. 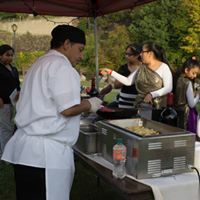 We work connecting residents across neighborhoods and generations to preserve the stories, cultures and history of Norwich and its incredible legacy of immigrants for future generations. 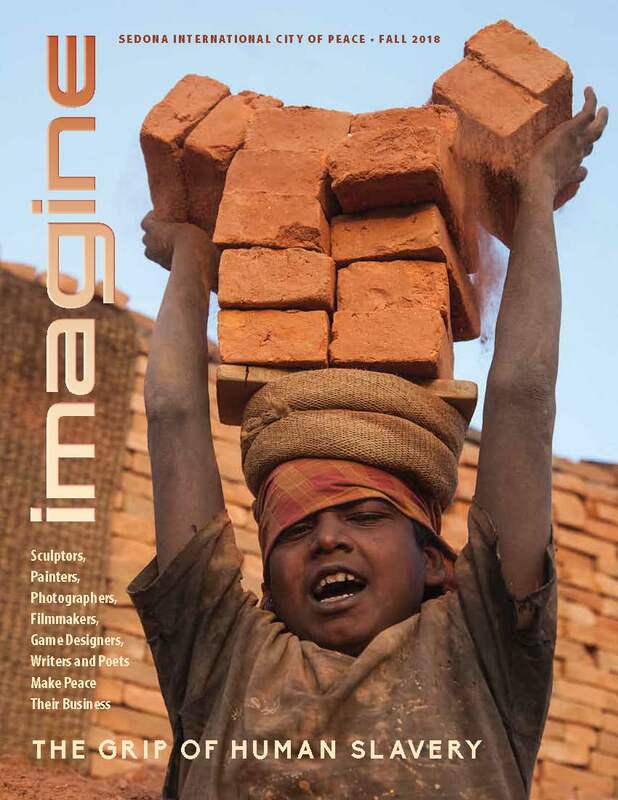 To unify causes, programs, people and organizations for the greater good of civil society. 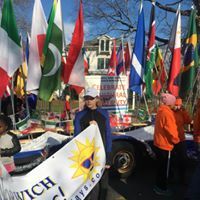 Our Vision is to spearhead sustainable peace and teamwork among our immigrant population and assist them in making Norwich a home where they feel safe and welcome. To restore and regain back the culture of peace through dialogue and action among community members, and by providing for basic human needs…. Food, Shelter, Clothing, Education, and good paying jobs for economic security. 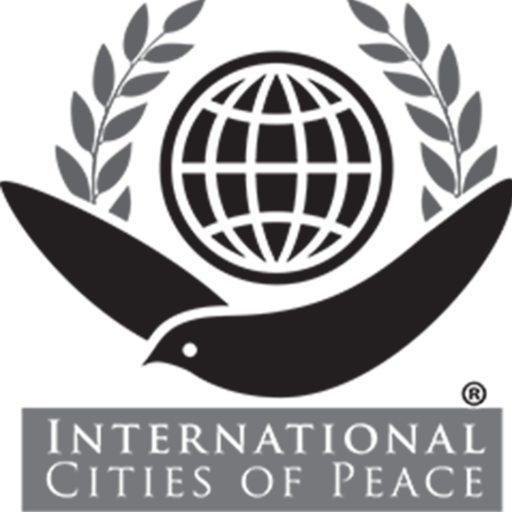 To maintain future collaborations with other Community organizations with similar interests in the regard of peace building. The Cultural Diversity Committee which started with the Norwich Rotary Club and has spear-headed the work to make Norwich an International City of Peace, currently includes members from the 5 Rotary groups,( Norwich Rotary Sunrise, Norwich Rotary Club, 2 Rotary Interact Clubs and The Rotary Community Corp), The Power of Purple, Norwich the Global City, Bully Busters, NAACP, and The Norwich Clergy Association. The Norwich Community is installing four Peace Poles, sponsored by the four Rotary Groups in the community. The Peace Poles have the message MAY PEACE PREVAIL ON EARTH, with 8 languages on each of the poles. These languages make up most of the Norwich Community, Our Rotary District Governor will be coming to this event to personally present to YOU and the other 3 Rotary Groups your certificate commemorating the Peace Pole you have sponsored. 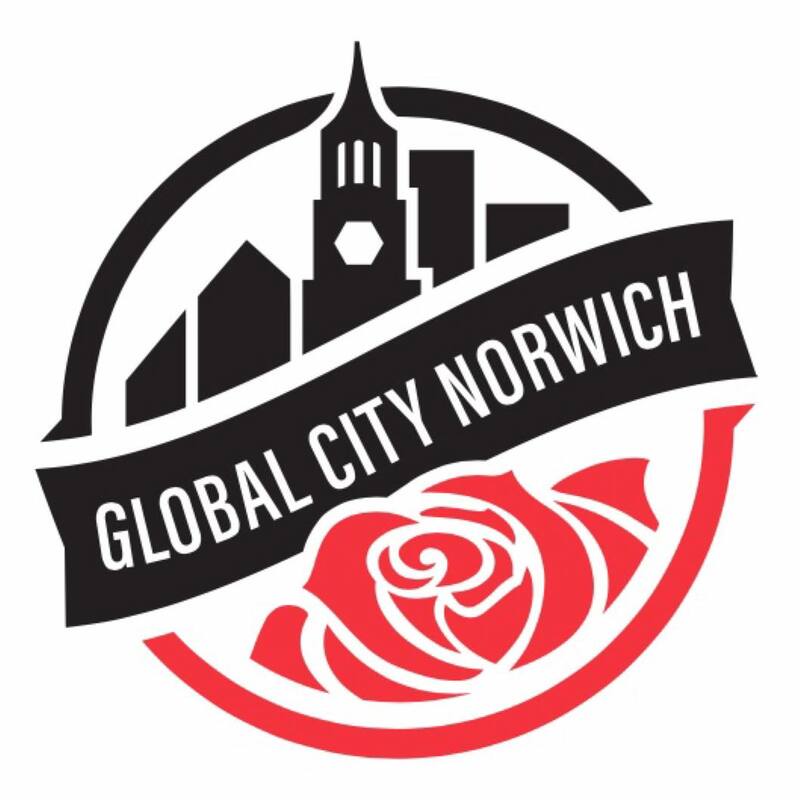 The Mayor of Norwich will be Presenting a Proclamation designating Norwich as an International Peace City, and our State Senator will be Presenting a Citation for all the work our City, Rotary, and other groups do to promote a non-violent resolution to conflict within our Community. A Peace Pole is an internationally-recognized symbol of the hopes and dreams of the entire human family, standing vigil in silent prayer for peace on earth. Each Peace Pole bears the message May Peace Prevail on Earth in different languages on each of its four sides that represent the languages and cultures that make up our City. There are tens of thousands of Peace Poles in nearly every country ( 180 ) in the world dedicated as monuments to peace and our shared values. People of all faiths have been involved in Peace Pole dedications, including the XIV Dalai Lama, Mother Teresa, President Jimmy Carter, Deepak Chopra and John Denver, as well as mayors, clubs and Girl Scouts. 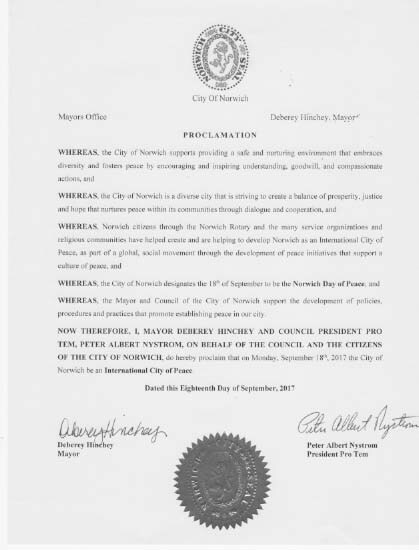 The Mayor of Norwich will be presenting a Proclamation in support of Norwich being an International City of Peace, proclaiming Norwich as a community strives for understanding, harmony, equality, fairness, and friendship in our communities. 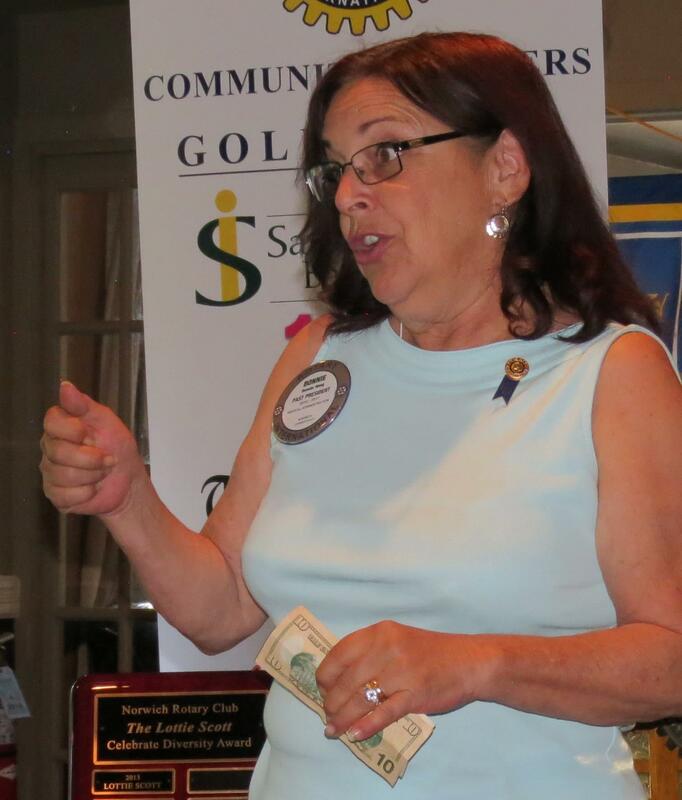 Bonnie Hong is a Registered Nurse, set up a private medical practice, served on the Norwich City Council from 1987 to 1979, and launched a company that provides Medical Office Software systems. as the practice grew to six staff physicians from 1977 until 2008.
office and submitted the First electronic claim to Medicare in the State of Connecticut. 1987-1991: Served on the Norwich City Council, and as the Chief Elected Officer for the City of Norwich. 1989-2000: I designed and developed a completely computerized medical office software system that included a complete EMR (electronic medical record) that electronically orders and tracks all medications, tests and lab results, and provides for electronically receiving, filing and tracking of lab and test results. setting to the homebound and shut-in patients who have no other easy access to medical care. 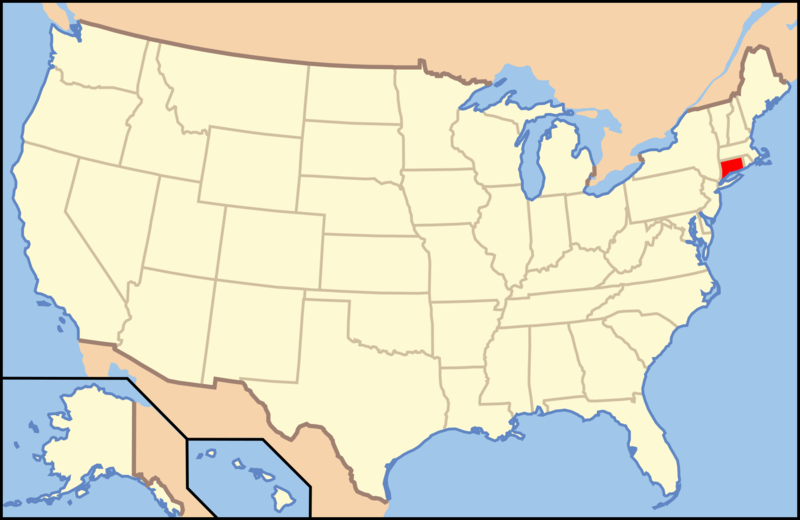 Connecticut is the southernmost state in the New England region of the northeastern United States. As of the 2010 Census, it has the highest per-capita income, Human Development Index, and median household income in the United States. It is bordered by Rhode Island to the east, Massachusetts to the north, New York to the west, and Long Island Sound to the south. Its capital is Hartford and its most populous city is Bridgeport. It is part of New England, although portions of it are often grouped with New York and New Jersey as the Tri-state area. The state is named for the Connecticut River, a major US river that approximately bisects the state. The word “Connecticut” is derived from various anglicized spellings of an Algonquian word for “long tidal river”. Norwich was founded in 1659 by settlers from Saybrook led by Major John Mason and Rev. James Fitch. The land was purchased from the local Mohegan tribe, led by their Sachem (Chief), Uncas. 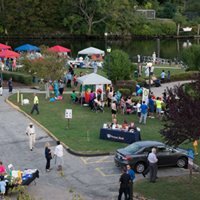 The early settlement was around the Norwichtown Green. Supplies were brought from a landing near the base of Yantic Falls. By 1684, settlers authorized a new public landing at the head of the Thames River, site of the present downtown. Of historical interest Norwich holds a prominent position. It has an aboriginal as well as an English and American history. The first planters were a body of men who displayed much of the genuine old English character, and left the impression of their origin deeply stamped upon our laws and regulations. 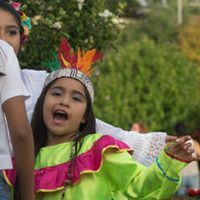 Since the Nine-miles-square was bought from the Native American Indians, no battles were fought and good relations were maintained with our Native American neighbors. By the early 19th century, the center of Norwich had effectively moved to the Chelsea neighborhood. The official buildings of the city were located in the harbor area, such as the City Hall, courts, and post office, and all the large 19th-century urban blocks. The former center is now called Norwichtown to distinguish it from the current city. Hello, with that spelling, was first used in publications in the US as early as the 18 October 1826 edition of the Norwich Courier of Norwich, Connecticut. Norwich has always been a destination for immigrants, and is not only a part of our history but a strength in our growth. From the early French, German, Irish and Polish immigrants that came to work in our factories to the African American slaves that came from the southern states to find freedom. More recent immigrants have come from Haiti, South America and Asia seeking a better life. We now have over 30 different languages spoken in homes here in Norwich.